Aden governorate citizens out in the streets, this evening yesterday , in an angry public protests for electricity outages , water, and the deterioration of services in the provinces. 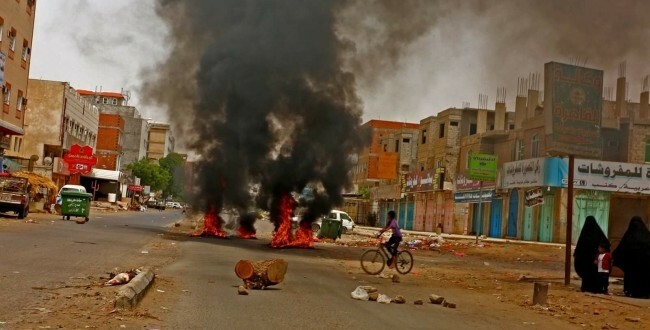 A local sources said that, hundreds of protesters gone to the streets and set fire and blocked each other with stones and garbage barrels, demanding the departure of Hadi forever. Most of the protests were concentrated in the districts of Dar Saad , Sheikh Othman , Al Mansoura, led to cut number of roads links between this districts with other. local sources confirmed that , a protester was injured by shrapnel in Al Mansoura, by gunmen shot towards the protesters. Power plants and water pumping fuel stopped about a week ago, more than 75% of the generating capacity of the power for the service, domestic water supplies stopped since Friday. In the same context the province is witnessing the deterioration of public services, the conservative Aidroos Zubaidi left to the United Arab Emirates, after growing criticism directed him and growing protests in the province.